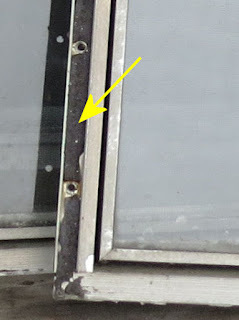 What is this rubbery layer that is along the channel where the screws go on these old aluminum windows? I assume it's to help seal the screw holes, but what do I call it to try to replace it. It's a total mess on most of the windows. Either gone or torn up. If I can't replace it, should I just try to put some sort of gasket under each screw head? Hi Joan, that stuff is butyl putty tape. And it seals the whole window not just the screw holes. It is sold in rolls as tape that is various thicknesses and widths. Hi Joan, that stuff is butyl putty tape. Pretty sure that's not what it is. I have the butyl tape for under the frames, and there is old butyl on the undersides. This has a lot more structure. It's almost like a foam product. This is on the outer side of the windows. If they are jalousie windows, there is normally a black or white flexible strip that goes into groves on the side of the frame. If that is what you need, you should be able to buy it at an RV parts store. I had no problem locating it. Below is a pic of the frame on my trailer, showing the "track" into which the strip is inserted. Originally Posted by Patricia D.
there is normally a black or white flexible strip that goes into groves on the side of the frame. That is exactly what it is, although these are not jalousie, but you've identified the stuff. Our RV parts store doesn't open till mid May. What should I call it to look on line? Its generally called screw cover trim. Interesting. These seem to cover the entire channel, but this is more of a foam product that the screws are screwed through. But I'll look at them more carefully. I believe I'm making this too difficult. I think it's just foam sealing tape. Is it possible that a previous owner could not find the trim so used the foam tape instead? Patricia- Maybe, but the foam stuff is fine. I found it in gray, so will look better than black, and just bought it. Word of caution (and personal experience) make sure any foam product you buy is not made in China. If it is, it will turn into a sticky mushy mess within a year or two. Make sure any foam product you buy is not made in the North America. If it is, it will sneak up on you and smother you in your sleep. Hehr screw cover, can get it from Walmart.com. Now what some prior owner used instead, who knows. Hehr branded jalousie windows use the Hehr screw covers, about $4 for 8 foot piece.